Today I have something a little bit different. No stamping (well, almost no stamping), no colouring, no punny greetings, something a little more serious. To begin, I used a damask embossing folder with some silver shimmer paper. I then threaded a length of tulle through a vintage button from my collection to create the look of a gown accessory and adhered it using half inch Skor tape. 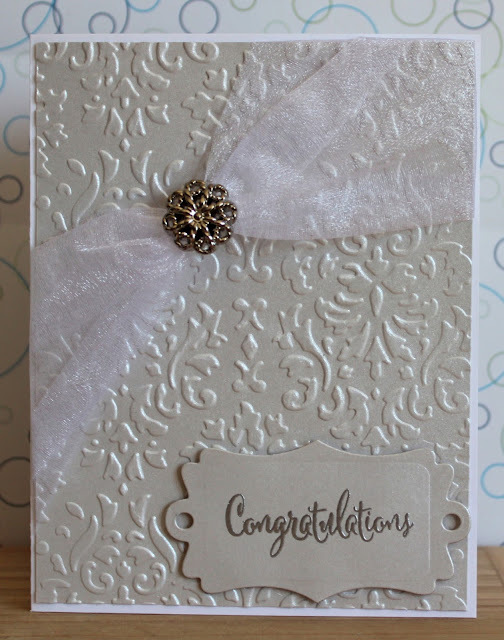 I chose this tape because it is incredibly strong and I wanted to ensure that the tulle wouldn't slip or come loose from the back of the card. I used a dab of Aleene's Glass and Bead Adhesive under the button to ensure it wouldn't move. I then cut a tag from the same shimmer paper and heat embossed the greeting, using silver embossing paper and popped this up on foam tape. I hope you like today's card and are inspired to create something of your own. Don't forget to follow me over on the right side bar so you don't miss any future posts. Toss me a line in the comments section below and let me know what you think.